Recently, I was catching up on life with an old friend, and as usual our conversation turned to dating. She gave me the 411 on her romantic life, then asked me about my going-on-17-months relationship with my boyfriend, Gary. I told her about music, church and his recent trip to El Salvador, and then she said something that I found amusing. "When I saw you were dating Gary, I was shocked," she said. "I just never thought you were the kind of person who would date a black guy." Now I'm paraphrasing, and also let me give you some background: we were at a gathering of a bunch of her friends, several of whom are black. She didn't intend that as a derogatory comment at all. But it made me chuckle, and I recalled that there are actually several people in my life who have said things like "I always knew you'd end up with a black guy." Heck, I've said that myself. That's Heidi Klum, supermodel and actress, on the left; her husband is English singer Seal. And on the right is Idina Menzel, the original Elphaba in the Broadway musical Wicked, and more recently Lea Michele/Rachel Berry's mother Shelby in the Fox television series Glee; her husband is Taye Diggs, whom she met when they were both in the original Broadway cast of Rent. 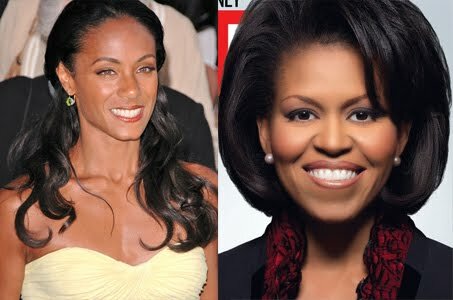 On the left is Jada Pinkett Smith, actress/producer/director/singer, and wife of the ubiquitous Will Smith. And on the right--do I really have to do this?--first lady Michelle Obama, Princeton University and Harvard Law graduate and husband to Barack Obama (yeah, yeah, he's only half black--Gary's 1/8 Cherokee). I talked to my dad about this the other day--he had overheard a conversation the other day where a white man was talking about someone and mentioned that "she's got herself a black boyfriend." It's interesting that we find that kind of thing worth pointing out. Sure, it's not the norm--but it's funny how we can be pointing out people in a room and say, "the guy in the red shirt is Bob, the girl in the blue shirt is Susie, and the black guy is Rob." That's not necessarily wrong--I mean, if there's one black guy in the room, it's easiest to point him out by referring to his skin color. If I'm the only white girl around (which happens to me pretty regularly), I have no problem being "the white girl." A few months ago, a friend of mine (who is white) told Gary and I about a frustrating experience he'd had at work. He was interviewing for a job and felt like it went really well. Later, however, his superiors told him they were concerned because he had said a few things that people might find racist. Here they are: first, my friend (who is also a musician) had been talking about a guy he knows who's a brilliant piano player, and he mentioned that he plays at a black church. Second, he referred to a client he'd been dealing with recently on the phone; her name was "Rosa," and my friend had no idea what ethnicity she was, but since she pronounced her name by rolling the "r," he did the same. His superiors felt like the reference to "a black church" was racist, and that he was mocking Rosa by pronouncing her name the way it's meant to be pronounced. I had to laugh at that. I'm sure that in professional situations you have to be particularly sensitive to such things, but I had to think, I feel like only white people who don't really know any non-white people would say something like that is racist. "Am I racist if I say I have a black boyfriend?" I asked. True, if I'm around black people I don't know, I'll use the term "African-American" if I have occasion to refer to race--but my dad pointed out that not all black people are African-American. What about Haitians? And there's a difference between Africans and African-Americans, both ethnically and culturally, even within the U.S. Anyway, this is just me throwing stuff out there to think about. Do you have to be a certain kind of person to date outside your racial/ethnic background? If so, what does that even mean? If we all are made in the image of God, what does that mean for how we understand race?